Warner Bros. and Legendary Pictures are hoping to get their own cinematic universe, called the "MonsterVerse," around Godzilla and King Kong. That heavily relied on the idea that they could successfully reboot the legendary ape on the big screen. It is now safe to say they have accomplished that goal. Kong: Skull Island has officially crossed the $500 million mark at the global box office, making it only the third movie in 2017 to do so. According to Variety, Kong: Skull Island officially eclipsed the $500 million mark at the worldwide box office on Thursday. The only other movies in 2017 that have accomplished that are Logan ($586 million) and Beauty and the Beast ($916 million). 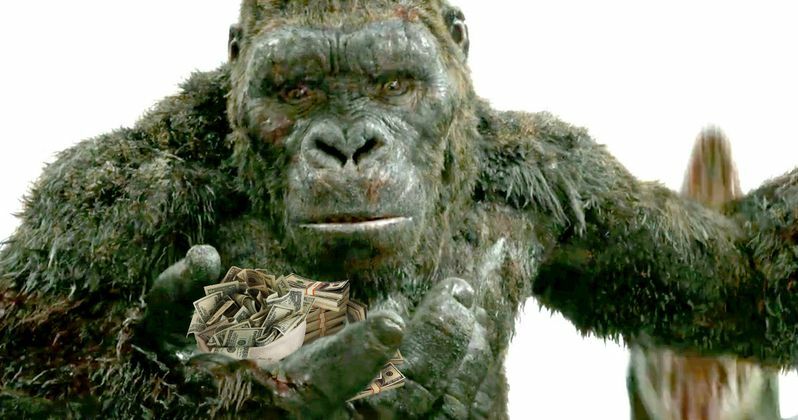 With a steep price tag of $185 million, Skull Island needed to make a lot of money in order to justify its existence. It may not be the biggest hit of the year when all is said and done, but it looks like this movie is going to make more than enough for Warner Bros. and Legendary to soldier on with this MonsterVerse. Here is the official synopsis for Kong: Skull Island. "The year is 1973. Somewhere in our world, it is said that there exists a wondrous island unspoiled by man - a land shrouded in mystery, where myth runs wild. Uncharted and undiscovered. When the secretive organization known as Monarch identify this destination as the origin point for mysterious new super-species, they mount an expedition to discover its secrets. What they find on Skull Island is an adventure beyond any human experience. An exotic paradise of wonders and terrors, where flora and fauna have fused together into an Eden of otherworldly jungle creatures." In terms of how Kong: Skull Island stacks up to other relevant movie monsters, it seems to be on pace to match, if not barely surpass, those that came before it. Peter Jackson made a very different type of King Kong movie back in 2005, which managed to gross $550 million worldwide. That movie had a slightly steeper price tag at $207 million. So Kong: Skull Island should be considered at least as successful as that movie when all is said and done. 2014's Godzilla, which was the first official movie in this MonsterVerse, made a grand total of $529 million worldwide. So it looks like Kong: Skull Island will probably wind up making either a little more or a little less than Godzilla did, come the end of its run at the box office. Basically, it seems like somewhere between $500 and $600 million is the going rate for a modern, blockbuster monster movie. Next up for Legendary's MonsterVerse is Godzilla 2, officially titled Godzilla: King of Monsters, which was teased in the post-credits scene of Kong: Skull Island, is getting ready to film later this year under the direction of Michael Dougherty (Krampus). After that, it will be an epic rematch with Godzilla Vs. Kong in 2020. These plans may have seemed a little lofty earlier in the year, but with the success of Kong: Skull Island, it looks like the studio knows what they're doing.